Anti-Arboreal Association | Countering the lies and evil of the sentient, rooted beasts all around us. Countering the lies and evil of the sentient, rooted beasts all around us. Just when you think we’re turning a corner on how people view the macabre menace sprouting all around us, the mainstream media sets us back another 10 years. This past season, Saturday Night Live showcased a pro-tree video rap. Brimming full of propaganda, adorable tree costumes, and CGI graphics injecting almost-President Al Gore, Pete Davidson and Chris Redd promoted a dangerous man-loves-trees message while demonstrating how to inject such nonsense into otherwise tree-free cement sanctuaries like trauma wards. Fortunately, the skit didn’t air on primetime television, but some lumber-loving social-media-managing sell-out at NBC posted it online nonetheless to ensure another wave of misinformation sweeps over our youth. If ever you were looking for a reason to switch to a Windows Phone, you’ve now got it. The bigwigs at Apple, Inc., looking for a good press win, have begun purchasing and installing a ring of 9,000 wooded warriors to protect their new corporate campus in some sort of twisted devil’s bargain. But, even worse than letting these barked behemoths spread their rot into the brains of Apple’s engineers? This sick flooding of foliage is forcing other Bay Area businesses to look for out-of-state scabs (errr, stumps) to fill their office park perimeters, allowing these foreign ferned fiends the opportunity to introduce new ideas to their Californian cousins. Anti-arborists everywhere should rise up and ensure no collaboration between these tree species occur. Let Apple’s new campus serve only as a modern prison for these 9,000 trees, not an opportunity for more of these abominations to plague our neighborhoods. We at Anti-Arboreal Association know that not everyone can quickly incorporate our teachings without a fair amount of deprogramming from the years and years of the trees’ lies. That’s why we’re so grateful that our friends at Owlchemy Labs have built an app for that: Jack Lumber (available on Google Play for Android or the iOS App Store). Chop through as many trees, logs, branches and twigs as humanly possible in this fast-paced and fun training exercise. Learn the most effective sneak attacks (remember: attack at night! ), try out the latest in power saw technologies, and quickly desentitize your young to the skills they’ll need in this new world order. In a recent paper published in the Frontiers in Plant Science, scientists find that trees let down their guard and sleep through the evening hours. Even better, this knowledge not only helps commercial interests but also all of mankind. So, next time you head out for an “evening jog,” don’t forget to grab a handy pocket saw for some late-night defenseless deforestation in your neighborhood. The dreamin’ demons (literally) won’t see it coming until it’s too late to sound the alarm. Easily the most disturbing news of the week: several students in Estonia wanted to give voice to the rooted creatures surrounding their village, creating a “sculptural art piece” allowing the nearby woods to broadcast their hate 24/7 into the minds of all citizens. Theoretically, the students of the Estonian Academy of Arts will next be delivering the house keys and weapons of all the town’s people to the trees in complete surrender of their duties to protect their people. Saturday Night Live bravely aired two warning shots to late night audiences this past weekend under the guise of “comedy” to avoid serious sapling scrutiny. While most know our esteemed Association for its hate-filled and fear-mongering tactics, we occasionally like to call out our brethren in the war against trees who show signs of success with a different approach. In this case, the fine folks at the Cat and Girl webcomic have found a means of introducing otherwise-unintending audiences to the wide world of the multi-facted rugged appearance of the anti-arboreal lifestyle using both comedy and subtle linework. Kudos to Dorothy Gambrell for helping to spread our ideas subversively. Support brave men like Nick, willing to counter the trees’ lies and hate; buy the issue today. We are all aware of the aftermath of feasting on your own species’ flesh: mad cow, spongiform encephalitis, etc. 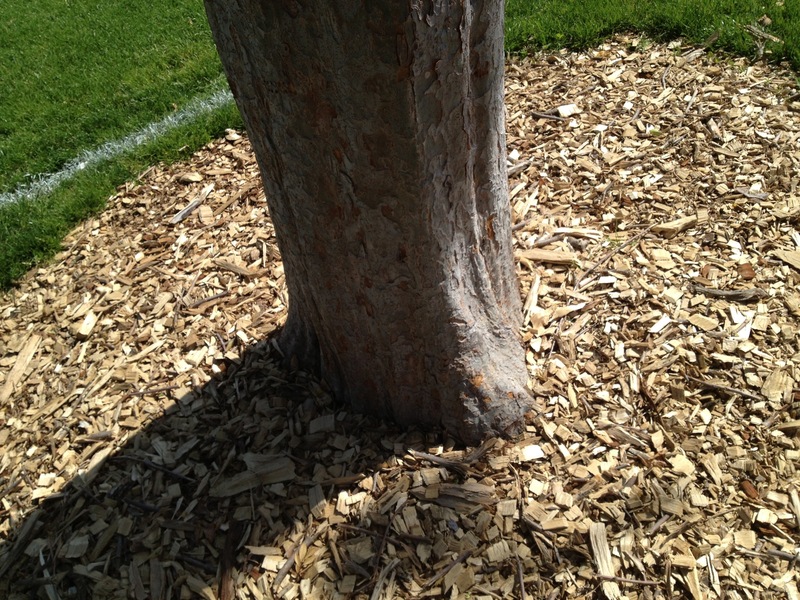 That’s why we at the Anti-Arboreal Association wholly and enthusiastically recommend surrounding your trees with wood chips. It used to be that folks would surround trees with grass, dirt, flowers, rocks, whatever; simple things that posed no barrier to the hate moving silently and surreptitiously under the soil to permeate our homes, buildings and more. Now, rather than waste efforts with futile containment, we have perfected a much crueler, sinister and effective barrier: stack their trunk with the carcasses of their fallen brethren. Let them choke on their own disease. So, as you walk through your sadly-shaded neighborhood this Labor Day weekend, consider ripping out your neighbor’s garden around their trees and helpfully replacing it with the fleshy shreds of the trees who’ve already fallen before the AAA’s sanctimonious shredders. Do your part today to drive these barked beasts mad from their own poison. Ever wondered to which music the Ents would march while destroying our civilizations? Wonder no more. German artist Bartholomaus Traubeck bastardized a perfectly good record player to the dark art of playing a tree’s growth rings. Chamber music, it is not. Thanks to BuzzFeed for raising our awareness. What you are about to encounter is years of accumulated knowledge, concised and repackaged into manageable, understandable chunks. Chunks that will help empower you in the fight against the ultimate evil. Granted, this information rarely takes upon first processing. Years of intense searching led us at the AAA to this point. We have displayed this knowledge then in a non-threatening online publication so as to invite all to our non-wooden table of freedom at their own pace. M. Night Shyamalan's documentary ("The Happening") about trees was labeled as a "thriller" by the MPAA, but make no mistake: the events in this film are truthy. Watch it now! All content Copyright © 2019, the Anti-Arboreal Association, except where otherwise noted. Photo courtesy of Miro-Foto on Flickr.